Since its foundation on 01 July 1975 the testing centre in Apulia (Italy) has been dedicated to cutting-edge development requirements. The Nardò Technical Center is celebrating its 40th anniversary today. The high-speed circular track that is unique worldwide with a length of 12.6 kilometres was built to improve research and development processes by enabling vehicles to be tested under extreme conditions. Since 2012 the automotive testing ground has been operated by Porsche Engineering Group GmbH, a wholly-owned subsidiary of Dr. Ing. h.c. F. Porsche AG, Stuttgart. With more than 20 test tracks and testing facilities on an area of more than 700 hectares, all conceivable testing stages can be performed here. The idea of a testing centre as an “association for automobile test tracks Nardò” (Società Autopiste Sperimentale Nardò) was realised by Fiat in 1975. Back then there was a circuit with tracks for cars and trucks and a dynamics test area for cars. Seven years later the facility was expanded to include a dynamics test area for trucks. In 1999 the Italian Prototipo Group acquired the testing ground and expanded Nardò by a total of 5,000 square metres with new workshop and office areas to meet the demands of the rising number of customers. In 2002 and 2008 test tracks followed for testing ride comfort and noise generation. A handling track was also created with a length of 6.2 kilometres modelled on individual bends of the Nürburgring's Nordschleife. In May 2012 Porsche Engineering Group assumed responsibility for the testing area. Nardò also enjoys its legendary reputation on account of its remoteness and the strict secrecy measures. For car manufacturers the almost unlimited and efficient opportunities for testing are decisive. For example, within the space of just a few weeks it is possible to make statements about corrosion resistance over the whole life cycle of a vehicle or to recreate the climatic conditions of different countries and regions – from off-road tracks in Africa to wet roads in the sunshine. Furthermore, time-consuming transportation routes and high transportation costs are avoided as the high diversity of the test tracks enables the developers to carry out a wide range of tests in the same place. The Nardò Technical Center has also written history on the circuit that has a diameter of four kilometres and a length of 12.6 kilometres and is still regarded as the world's fastest automotive circuit. It forms the basis for numerous records set by different car manufacturers. The first was set by Mercedes-Benz with the C111-IV in 1979, which broke the 400 km/h limit for the first time with a speed of precisely 403.978 km/h. In 1980 the ARVW (Aerodynamic Research Volkswagen) set six class records at once and two world speed records on the Nardò track. In 1982 Porsche set a 24 hour record with the 928 S. The Porsche that was revolutionary for its time with a front-mounted engine and a manual gearbox on the rear axle drove 6,033 kilometres at an average speed of 251.4 km/h. More than ten years later Porsche delivered impressive proof of the effectiveness of the transaxle configuration: in 1993 a private Austrian team covered 6,377.25 kilometres in 24 hours in Nardò in a production Porsche 928 GTS, achieving an average speed of 265.72 km/h. This record was not broken until 2002 by the Volkswagen concept car "W12 Nardò", which holds a total of seven world records to the present day, including the 24-hour distance and speed record over a distance of 7,740.576 kilometres at an average speed of 322.891 km/h. The great diversity of Porsche sites at a glance. 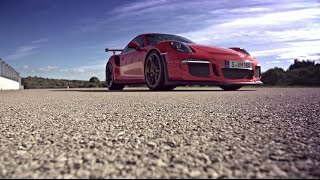 Mark Webber test drives the Mission E on Porsche’s test track at Weissach. Here are his impressions.